The face of fashion is changing in 2018. Innovative technologies are breathing new life into the industry. British marketplace OnBuy pulled highlights from Fashion Tech Trends by Accenture.com to show how the clothing and accessories industry has only just begun to unleash the potential of digital fashion technology based on computer sciences, communication and electronics, with 6 transformative trends to note in 2018. By integrating wearables in fashion, it is possible to impact quality of life, social setting and environment in a positive way. Think - incorporating heart rate monitors and fitness trackers to monitor health conditions. Or, the ability to track an individual's carbon footprint. It may even be possible for energy needs to be met with rechargeable batteries - or solar cells - making wearables a source of power for portable devices. In a digital dressing room, sensors can read radio frequency identification (RFID) tags or threads put on or in the clothing items a customer is trying on, connecting with a smart mirror. This allows the customer to browse styling options, request the assistance of a staff member and even order additional clothes and accessories from inside the fitting room. The concept of connected clothes shows great promise. After all, an improved fitting experience, well-informed and ethical purchase decisions, and an increased awareness regarding the implications of ones' behaviour, will ultimately improve conscious consumption, decrease energy needs and reduce waste. In 2018, consumers are more conscious than ever before. This trend is causing a shift from first-hand retailing of clothes being produced and sold in store or online, to new consumption models such as clothes-as-a-service, where users only pay for the amount of usage of a selected garment. This allows shoppers the opportunity to share clothes. This concept also includes sharing platforms that allow users to rent garments or post their own garments for rent or sale. This approach increases the utilisation rate and reduces waste of textiles and natural resources used in the production process. 3D solutions, such as printing and scanning, are providing new opportunities in sustainable sourcing and production. To print a garment, sequential layers of fabric are shaped to create a piece of clothing. The process is controlled by a computer and can be manufactured on an industrial scale. This approach enables just-in-time product development on your doorstep. It also minimises waste of raw materials, packaging and transportation. In effect, 3D solutions bring the consumer and production site closer than ever before. Nanomaterials enable the fashion industry to shift from traditional materials to new 'smart' fabrics, which have novel capabilities, such as the ability to self-clean or absorb pollutants. This innovation could reduce the need for water and cleaning products as clothing becomes less prone to stains and odour (perfect for sportswear!). 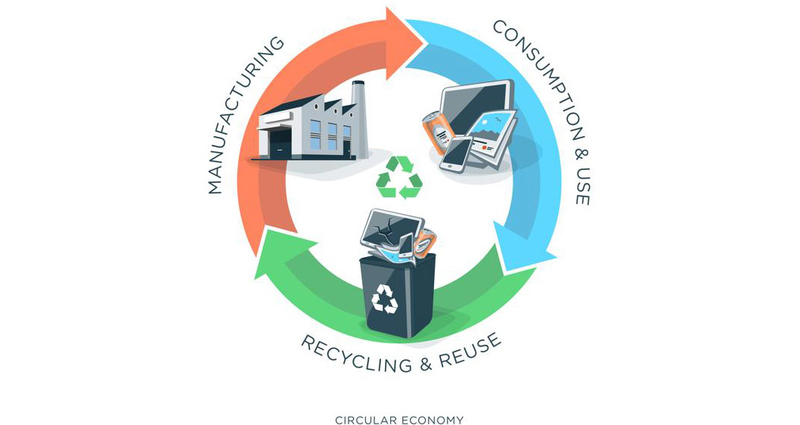 An extended lifecycle will also decrease the need to buy new clothes, promoting waste reduction. Until now, it has been challenging to use robotics in the retail production process, due to the materials' characteristics, such as being soft, elastic and fragile. Today, the production process can be automated using technological advances such as IoT, artificial intelligence and physical robots. For example, a robot's movements can be carefully directed by technology continuously capturing and interpreting real-time photos of the garment. This helps to ensure that the textile is handled properly and is not overly stretched. The use of robotics in fashion retail can enable increased precision in forecasts and production planning. 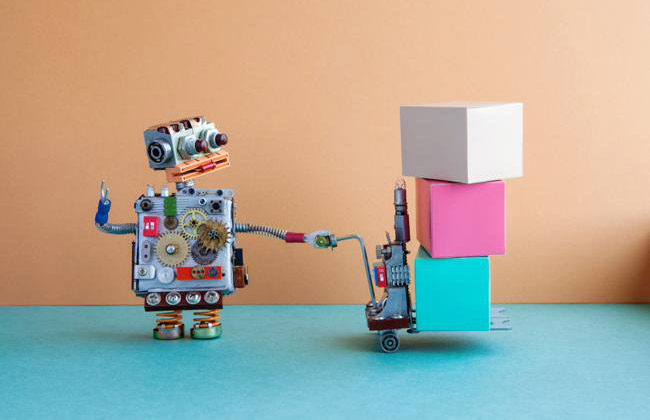 In addition, robotic process automation (RPA) can further improve efficiency, accuracy, quality of planning and monitoring. Biomimicry refers to solving human challenges in a sustainable manner by studying and imitating nature's best designs and processes. Examples of this trending concept includes spider silk to produce biodegradable garments, artificial leather made from wood, and altering cotton crops to enable faster growth and less need for water. This type of innovation will also reduce the need for toxic synthetic chemicals when dyeing materials through utilisation of naturally pigment-inducing organisms. 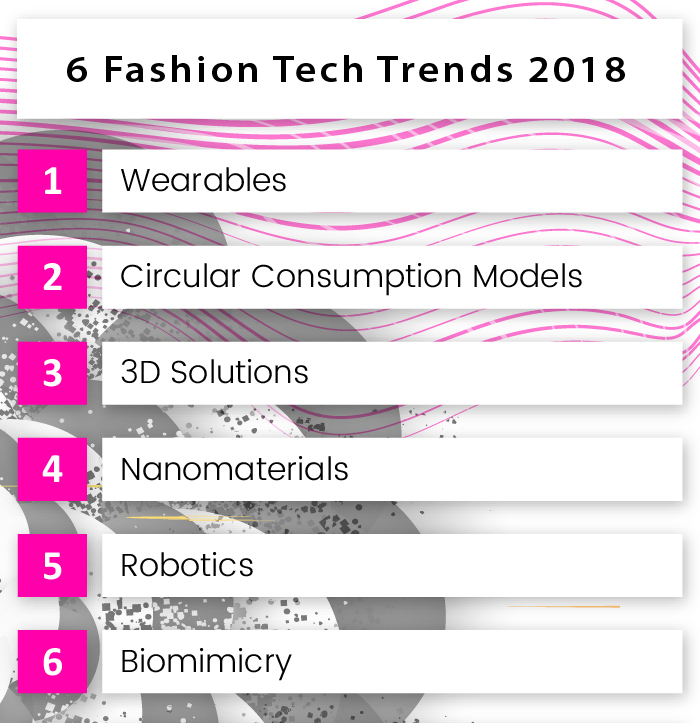 If you enjoyed reading about the latest fashion tech trends, why not try 9 New Technologies to Consider in Retail 2018, which considers technology in retail more broadly.